I was not sold on the idea of Blake Lively as an actress. Yes, she is very beautiful, but there are many beautiful women in the world (not my world, but in the world in general). The Age of Adaline, however, makes me think that perhaps, with the right role, Lively could indeed be a good actress. Perhaps not the greatest, but just by The Age of Adaline itself, I think she has potential. That is more than I thought in the beginning, so that's a plus. Adaline Bowman (Lively) is an ordinary person, born in the turn of the century, married, had a child, lost her husband in an accident, and pretty much lived her life until during a snowstorm she has a car accident. A freak occurrence with her freezing to death in the cold water and being almost simultaneously revived with lighting has left her forever young, looking 29 despite the passing of the years. She no longer ages. This complicates matters when she stays looking young while the world passes her by. It means for her own safety and that of her daughter Flemming she must be on the lamb, changing her identity every few years to stop being traced, her secret known only to Flemming (Ellen Burstyn). Currently going by Jenny Larson, Adaline watches the world go on and on, and she has resigned herself to being alone, for if she falls in love, she will be condemned to watch him wither and die. She has come close to giving in to love, but always must turn back. That is, until one New Year's, when Ellis Jones (Michiel Huisman), a wealthy man who is instantly attracted to Adaline. She won't commit, but he is gently persistent and manages to woo her successfully. Flemming is happy for her mother, and Adaline agrees to go meet Ellis' parents. To Adaline's astonishment, Ellis' father is William Jones (Harrison Ford), whom she had a very serious affair in the 1960s and was close to getting engaged to. William is also the only man whom she revealed her true name of Adaline. In an effort to hide the truth, she claims that William's Adaline was "Jenny's" mother. At first, the rest of the family is astonished by the coincidence that the daughter of their father's first great love is now the girlfriend of their brother/son. However, William soon realizes that Jenny is not Adaline's daughter, but Adaline herself. In a panic over the discovery, she flees, despite William pleading to remain for Ellis' sake. Adaline by now has fallen for Ellis and decides to face the music. However, as she attempts to return she is involved in another car accident, whereupon she again dies and is revived. Adaline now reveals the truth to Ellis, and tells Flemming she doesn't have to pretend to be her grandmother. A few months later, the three of them get ready for another New Year's Eve party, when Adaline notices something strange in the mirror. It is a grey hair, showing that she now is finally aging again. By no means am I calling The Age of Adaline a great film, but for what it was, a fantasy-based love story, it works wonderfully. If you accept the premise and everything that goes with it, The Age of Adaline can almost be as romantic as it wants to be and is working to be. On a deeper level, I would say that The Age of Adaline is really about the fear that goes with love, fear of being left, fear of not finding that 'forever love' people constantly search for. For Adaline, that fear is not so much of not being able to love, but being able to outlive anyone whom she does love. One wonders whether J. Mills Goodloe and Salvador Paskowitz would have dared suggest what would have happened to Adaline should she had outlived Flemming, which is a certainty. What kind of devastation would that have brought about, knowing that the only person who knows the real person is now gone (and while I can't remember, I don't know if Adaline had grandchildren or if she did, they would know the truth). This idea is never explored, but kind of hangs there for anyone who gave it enough thought. That being said, I found myself oddly enchanted by The Age of Adaline, and I think this has to do with the performances. Blake Lively has simply never been better in anything she's done as the slightly ethereal, aloof Adaline, who loves but fears she can never have that love reciprocated. She has her dogs, but whenever she's had to put one down she knows that immortality is a curse, not a blessing. There is a scene when after her most recent dog has died, she looks at the photos of all her previous pets, and the sadness and heartbreak of knowing the pain of eternal youth and the grief of death she must constantly experience is so well-done. In her separation from the world, Lively has made this elegant yet sad figure someone we end up caring about. Classy, sophisticated, yet approachable and endearing, Lively was wonderful in a part that was a bit hard to believe. Equaling her is Harrison Ford, who had been a bit lost in such things as Cowboys & Aliens. Here, he too excels as the man who loved and lost and found love with someone else, who unlike Adaline, was able to move on, only to find the past returning literally to his front door. Yes, it is a bit implausible that Adaline should find herself having slept with both father and son, and that William is Ellis' father, but just go along with it and don't get hung up on details. I can't say Huisman gave a great performance, but for what the film was, his role as the love interest was well-played. Again, his performance doesn't show he is a great actor, but it wasn't a particularly great part either. It is a bit of a shame though that we had little for either Burstyn or Kathy Baker as William's wife/Ellis' mother Kathy to do. There were elements of a conflict between Kathy and William about Adaline/Jenny and the ghost Adaline cast over them, but the situation was handled quickly and nothing more was really said about it. As Flemming, Burstyn was her usual great self, playing this as believably as possible to address someone a good fifty-plus years as your mother. I really can't fault The Age of Adaline for being overtly romantic in an almost-Somewhere in Time style. Everything was meant to be pretty (including the actors), everything was meant to be romantic, everything was meant to be a bit fantastical. I can't really go after a film for setting a particular goal and meeting it, even if it wasn't a particularly lofty goal. On the whole, The Age of Adaline was trying to be a beautiful love story of an ageless woman who reaches out, and it was pretty successful. 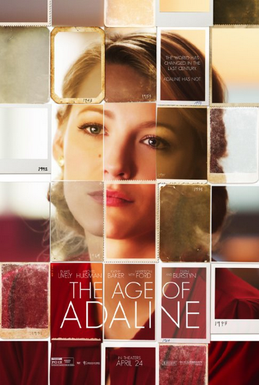 Perhaps not the best variation of this 'timeless love' type-story, but with solid performances by Lively and Ford, The Age of Adaline succeeds in what it wants to do. The film may not be ageless, but it will do for now.